As for George Forrest, exhausted by the journey he let Litton's words take the place of his own in letters home and in a paper to the Royal Geographical Society.16 He was accustomed to being struck silent by views of glistening snow covered peaks, "beyond conception" or "beyond description." They signaled to him the limits of thought and language. He would forget about that distant, shining range for many years as he explored other parts of Yunnan. But eventually, inspired by his indigenous collaborators, he would remember it: as the sign of something always beyond his grasp; as a solution to the great phytogeographical puzzle of the genus Rhododendron; as a transcendent Eden, where the difficulties of engagement and representation that this landscape presented might finally melt away. When a child died in a Naxi home in the Lijiang valley, her parents sent for a ritualist, a dongba, who helped wash the corpse, dress it in new clothing, and place it in the coffin. A little later, the parents held a funeral in their courtyard, attended by a few kin and friends. The dongba read several manuscripts. Only Lònv was written specifically to send a child off on her final journey. It seems to have been rare: many funerals for children probably did without it. It described the child's soul, unable to eat, unable to see and hear, unable to use hands or feet, unable to clothe itself. It spoke of the child's journey across a rope bridge separating the world of the living from the world of the dead. It told of how a dongba cut the bridge with a knife, severing the link between the two worlds in order to prevent parents or siblings from following. The manuscript specified the materials to be used: sacrificial animals, black clothing, a strip of blackened hemp for the rope bridge, a fir branch to which the rope was tied. Other texts described the soul's journey, guiding it north through the mountains of northwest Yunnan, toward the lands from which the ancestors had come, and eventually to the great mountain Ngyùná Shílo Ngyù, origin of all things, where the worlds of mountains and forests met the worlds of the gods. A photograph and a drawing. Each might be said to participate in a separate archival regime. They are archival in the most obvious sense. They are both fragments of large collections that came together in focused historical periods, in projects that followed quite precisely defined rules. I find the word "regime" appropriate because of its use in physical geography to connote all the factors that create the quality of a river's flow: the amount of rainfall, the type of bedrock, the shape of the channel-everything that makes the river meander, braid, flood, disperse into deltas or join with other streams. In a similar way, an archival regime includes all the rules, habits, and ideologies that decide how perceptions are transferred to paper, collected, and stored. It includes habits and ideologies of seeing and walking, of inscribing and photographing, of collecting, shipping, storing, organizing, and reading. The British expedition up the Salween was guided by what Bernard Cohn called a "survey modality" of investigation. This mode of summing up a landscape and its inhabitants in a series of comprehensive reports had been central to the colonization and administration of India. Litton's report was added to the heaps of documents written by colonial explorers and administrators in India that had been piling up in the archives of the British Museum, the Royal Geographical Society and related institutions for over two centuries. The British consul who replaced Litton sent all Forrest's photographs from the expedition to the Royal Geographical Society. His images of bridges were filed in drawers marked "bridges," of people in drawers labeled "types," of crossbows in drawers stamped "weapons." Thomas Richards has argued that this kind of archival activity, more than any process of administration or governance, was the central project of the British Empire during the late nineteenth and early twentieth centuries. After the mid-nineteenth century, British imperial power found unity and coherence in an archival myth: the idea that institutions of knowledge production could forge the millions of facts flowing in from all corners of the world into a coherent whole. In an empire where administrative institutions were thinly spread, this myth of archive took the place of actual civil governance in many places. Litton and Forrest participated wholeheartedly in this myth as they walked up the Salween. Despite the complete absence of any British civil authority in the region, the failure of numerous plans for a railway linking Burma to the Yangtze, and the Foreign Office's stated abhorrence for any further expansionist adventures, they both looked forward to the immanent British annexation of Yunnan. Even so, this would be the last time Forrest would imagine himself directly involved in the project of imperial administration. After Litton's death, his activity would be guided by a more limited regime within the survey modality of investigation. The Lònv text was a fragment of another archival regime. Naxi ritualists probably began writing manuscripts in pictographic script sometime during the Ming dynasty, as armies from Lijiang swept through the province's western regions. During the eighteenth and nineteenth centuries, they wrote and copied these books with great assiduity. In the early twentieth century, tens of thousands of manuscripts were stored in the attic libraries of dongba in and around the Lijiang valley. Most were written to be recited during ritual performances; some were for divination and astrology. Many rituals took the form of driving or guiding inhuman entities over the landscapes of northwest Yunnan, and many texts contained long lists of places, some extant, some once extant, some belonging to other worlds. As a whole, the archive of dongba texts contained an extensive geography of northwest Yunnan, far more detailed, at the opening of the century, than any other representation in maps, reports, or herbaria. This archive too was underlain by rules, habits, and ideologies of seeing and walking, writing and collecting, storing, organizing, and reading. Dongba did not create and organize knowledge for purposes of rule, though perhaps they once might have. They wrote and copied texts to regulate the social well-being of people and communities by manipulating relations between human and nonhuman social entities. Their mode of investigation did not survey the landscape. It auscultated its depths, threw out lines of communication to its hidden presences, and divined traces of a past that had vanished from its surfaces. One might think that each of these two regimes would be incomprehensible from the point of view of the other. And indeed, there is no evidence that either directly incorporated knowledge from the other. Forrest did not find routes, place names, or plant names in dongba texts: he was barely aware of their existence. And no dongba altered any text to include botanical or geographical knowledge created by Zhao Chengzhang and the twenty-five to thirty others from Nvlvk'ö who worked with Forrest. Nevertheless, the two regimes came into close contact for nearly three decades, and at some points of friction they very likely shaped or deformed each other. But Zhao and his fellows were experts in other realms as well. In many ways, dongba culture had been in decline since the eighteenth century. It had largely moved out of the towns of the Lijiang valley into the surrounding mountainous countryside. Located just above the edge of the valley, their village belonged to this drier, poorer, mountainous hinterland. But it was also in the orbit of the market town of Baisha, long the most important center of dongba learning. Nvlvk'ö and the other villages in the southern foothills of the Yulong range, though small and poor, contained the greatest concentrations of dongba and libraries of dongba manuscripts remaining within the loop of the Yangtze. It was from Nvlvk'ö that the dongba archive moved out larger world: when Joseph Rock began to collect dongba books there, he had a library of hundreds in within days and thousands in a few months. The money they earned from their quest for flowers made Zhao Chengzhang and his colleagues their village's most prosperous and important citizens. As elders, they officiated at village-wide events like the yearly muanbpò ritual to regulate the village's health; they were the central guests at funerals; and they were in a position to sponsor rituals to cleanse their houses, cure their kin, defeat slander, and overcome drought. Dongba books were central to all these activities: from just a few to as many as seventy were read aloud at each. There is no evidence that Zhao or any of his colleagues were trained as dongba, but it is certain that they listened to many key books being recited many times: they all had a general knowledge of the dongba corpus. Despite the slow general decline of the dongba cult, it was still, for these men, a deep source of knowledge, attitudes, and orientations, particularly about its central protagonist, the living, spirit-inhabited landscape of northwest Yunnan. In Part 1, I place these two archival regimes side by side in the context of Forrest's and Zhao's explorations of northwest Yunnan. For the men from Nvlvk'ö these regimes were very much coexistent. But to understand the specific ways they coexisted and, perhaps, intersected, can only be a speculative exercise. As I mentioned in the Introduction, almost nothing written by the first generation of explorers from Nvlvk'ö remains: there are only Zhao's four maps and two scraps of ledger, a few labels on bird specimens, and one brief, crudely written thank-you note. Any ideas about their relations with the gorges, mountains, and meadows they wandered have to be pieced together from two very different sources. On the one hand, there are Forrest's letters, reports, notes, and photographs, tightly focused on the botanical enterprise. On the other, there is the massive archive of dongba texts, collected within the Yangtze loop, supplemented by a small descriptive and ethnological literature about the Lijiang valley and the Baisha region. Tacking between these sources, I make several conjectures about how the dongba archive might have rubbed up against, and created new and compelling possibilities for, the phytogeography of northwest Yunnan. In particular, I show how the dongba corpus might have shaped the decade-long quest of Forrest and his mentor Isaac Bailey Balfour for the center of origin of the genus Rhododendron. I speculate about how the encounter between the dreams of geographical botany and the words of dongba texts might have tilted that search north and west, focusing it finally on that gigantic range that Forrest saw glowing in the distance during his walk up the Salween river with Litton in 1905. These arguments are the path I have chosen to trace through the geographies of these two archival regimes. Route maps such as these, even if limited in scope, are perhaps the best way to come to know such a geography. The alternative-maps that pretend to a comprehensive domain view-would fail this vast, varied, complex, and interesting landscape in important ways. Along this path, I open up some of the questions that animate the rest of this book. How do rules about how we must perceive inflect how we walk and see? How do perceptions inscribed on paper become interleaved with the substance of the earth, to inflect other perceptions? How in this process does the earth emerge into social being? In what ways might this social being serve as a resource for experiences that circumvent established ways of thinking and living the divides we make between the social and the natural? Above all, he discovered opportunities to reaffirm his middle-class faith. This faith emphasized that the core of true masculinity was individual integrity and freedom from subjugation to the will of others. The most fundamental demonstration of masculinity was the capacity to establish, protect, provide for, and control a home.25 He had established the foundations for his future domestic life before leaving Scotland, promising himself to Clementina Trail. He would spend the rest of his life working to build and provide for a home over the distance between Yunnan and Edinburgh. In India and Burma, he quickly learned to reframe his masculine sexual virtue along racial lines. At night, a new acquaintance took him to Bombay's brothel district. There, the filth, nakedness, and wretchedness of racially other bodies that had assaulted him in the daytime streets were concentrated in experiences of unregulated transgress of boundaries, moral and physical: "In the native quarter ... the stench is indescribable in places ... a mixture of sweaty bodies and all sorts of reeking abominations.... I never thought it possible for vice to be paraded so openly anywhere. We were continually being tackled by the women, some of whom even went the length of trying to get into the carriage beside us.... I pity the poor wretches." In Bhamo, the last steamer port on the Irrawaddy before the frontier with China, he was advised to buy a Burmese girl to take with him. "All the officers in the regiments stationed here ... keep them.... I could get a dozen tomorrow if I wanted them .... but I wouldn't touch any of them with a tarry [that is, tar-covered] stick. There is only one woman in the world for me and that is Clem, and she is white all through.... I have kept straight all my life and I have every reason in the world to keep straighter than ever. "26 It was a full and satisfying conflation of racial and sexual purity. He experimented with attitudes towards officials and soldiers he met along the road. He regarded them all as "Chinese"; later he would learn to make finer distinctions: on both sides of the border he passed through what he would come to know as Shan states. Near the border, the party waited several days while the commander of a Chinese battalion stationed in the region requisitioned men from surrounding villages to build a bridge across the Namsa (Namwan) river for the caravan.30 He entertained the region's elite, including the district military commander and a "rather curious old cove" who was probably the hereditary ruler (sawbwa) of a Shan state. They exchanged calling cards, eggs, whisky, biscuits, chickens, cigarettes, tinned plums, and cherry brandy. "The soldier one ... is a most kindly and polite little fellow, and I liked him best of all. He at once started to try to learn me Chinese. "31 It was among the most genuinely good natured exchanges with local elites he would ever record. Only a few years before, combined European forces had put down the Boxer rebellion, occupied the capital, forced the empress dowager to flee, ransacked the Summer Palace, and forced huge indemnity payments on China. The uprising had not spread to the southwest, however, and remote Tengyue had seen no violence. Even so, anonymous notices sometimes appeared on the streets excoriating the weak Qing government, decrying foreign influence, and agitating against British plans to build a railway from Burma. Two months after Forrest's arrival, Litton telegraphed to warn the Foreign Office that the Chinese authorities had received a rhyming pamphlet stating that foreigners "practice the violation of Chinese women and children and destroy tombs." In fact the pamphlet (a copy of which Litton sent with his report) was an announcement in somber verse by the Tengyue Militia Office (tuanlian ju) of reforms that would eradicate abuses and introduce more discipline into training, with the aim of discouraging the foreign powers pressing at Yunnan's borders.33 Forrest gradually came to understand that the townsfolk of Tengyue were more interested in peaceful trade than violent nationalism. In subsequent visits, he abandoned the shows of force to which the other Europeans in town seemed addicted. He recorded these confessions in a diary in the form of letters addressed to his mother, who passed them around to Clementina and his sisters. Letters were his sole means participating in domestic life, positioning himself as a proper husband for Clem, whose parents, from a higher class, disapproved of him. He was feeling his way. Here, the mapping of difference was far more fluid than in India, where it was supported by state institutions. Each outburst was touched off by the "insulting" behavior of people who appeared not to recognized distinctions he was anxious to assert. But there was more to it than his perception of insult or threat. In India, his interactions with different others had been accompanied by pity, loathing, and reaffirmations of racial and sexual purity. He had seized every opportunity to reassert moral and physical boundaries: he might gaze at vice, but he would never let it into his carriage. Here, confrontation with difference inspired rage and hatred instead: he had so quickly reached the "kicking stage," mixing it up with all the sweaty bodies. How real was the threat he felt? Certainly antiforeign nationalism was rife in those years preceding the 1911 revolution. And just as surely his posture incited hostility. One can imagine the anger of townspeople thrown out of their temple by an arrogant, rifle-wielding foreigner. But for many in the crowds, courtesy rather than hostility may have been the prevalent mood. These were the same looks imperial officials expected to receive as they traveled through towns with retinues of servants and gaudy palanquins, and they took these looks to evince fear, respect, and obeisance to authority. For Forrest, however, the looks were the problem. Why would the "average Chinaman rile the heart of a wheelbarrow"? It was a matter of ocular posture-what he called "gaping." It was not that these open looks were always evidence of hostility, though they sometimes were. It was not that they always challenged his superiority, though they sometimes did. It was that in gaping crowds he had no means of dialog, no words to learn, no gifts to exchange, no calling cards to accept, no language at all, whether about difference or identity. Mute gaping stilled exchange, reducing relations to the purely visual, a terrible mirror. Kicking, laying about with a stick, grabbing people by the seats of their pants, were ways of breaking that mirror and establishing contact. Conditions of visibility were a persistent concern for colonial scientists and travelers in the nineteenth and early twentieth century. The power to frame what was seen and to regulate affect attached to seeing were at the heart of many imperial projects.37 Imperial men and women created cultures of display, in which exhibitions and photographs represented the colonized world as objectively visible.38 Historians of colonial photography have explored many ways in which photography structured fields of vision to emphasize the subjective, empirical gaze of the imperial viewer and deflect the power of returned looks.39 British colonial travelers reproduced the "world as exhibition" by following established itineraries, seeing famous sights in predictable ways, and structuring their visions of the landscape around specific aesthetic principles: the sublime, the picturesque, the romantic, the realistic.40 Relations of visibility were always entangled with relations of difference. Deborah Poole has pointed out that the production and circulation of millions of photographs of colonized peoples "lent support to the emerging idea of race as a material, historical, and biological fact. "41 Theories of race created racial categories much the same way Linnaean taxonomy created species, selecting particular features to use as criteria. Racial theorists chose photographs to use like botanical type specimens as standards for comparison. And photographs of colonized peoples circulated through public and private archives, where they were categorized and organized through the principles of an archival regime. Exhibitions, photography, and science were machineries for framing and structuring fields of visibility-the gazes of "imperial eyes. "42 In the ambiguously colonized peripheries of empire, however, these were cumbersome machineries, laborious to master and difficult to apply to daily experience. During his first expedition, Forrest struggled to reconcile the landscape of China with the world that exhibitions and photographs of the colonized world had conditioned him to expect. Eventually, he learned to coordinate different modes of visual exchange with a typology of race and map them onto the aesthetic, affective, and botanical qualities of the landscape. The possibility of such a cartography began to dawn on him during his first journey with Litton. North of Lijiang, the travelers walked for three days through the deep gorge of the Jinsha, or upper Yangtze, in a "magnificent heat." They climbed out of the gorge to a boggy pass, where they camped in heavy rain. Forrest happily collected some of his first alpine flowers: Gentiana, Primula, and Saxifrage.43 The next day, the party descended to the Zhongdian plateau, a triangle of very high land about ninety miles long, surrounded by mountains and the Yangtze gorge to the south and bordering on the Tibetan region of Kham to the north. This plateau, known in Tibetan as Gyaltang, was a strand in the network of roads linking Yunnan to Tibet and Southeast Asia, known as the Southern Silk Road; it was the main corridor for the trade in tea and horses between Yunnan and Tibet. It had been passed back and forth among polities for centuries.44 From the mid-seventeenth century, the plateau had been ruled by a hereditary nobility of two lineages who traced their ancestry to the ancient Tibetan kings. In 1723, in the context of a widespread rebellion against Qing rule in eastern Tibet, the Yongzheng emperor ordered armies from Sichuan and Yunnan to occupy the plateau. It was formally absorbed into the province of Yunnan as Zhongdian; appointed officials were sent to govern it; a garrison of some eight hundred imperial troops was installed in its largest town, and the hereditary rulers were demoted to district commanders.45 By the time of Forrest and Litton's visit, then, the plateau had been within the fold of imperial administration for a century and a quarter. Nevertheless, the hereditary officials had retained their armies and much of their influence, and imperial officials seemed to have great difficulty asserting administrative control. In 1905, the subprefect (tongpan) subordinate to the prefect of Lijiang controlled only forty soldiers, remnants of the garrison installed in 1723. This tiny army had recently been faced with rebellions in seven of the plateau's eight districts.46 Three miles north of the plateau's center of government was an important Gelugpa monastery, housing 1,226 monks, another competing source of political authority. Forrest and Litton walked over the plateau in the rain. It was, Litton wrote in his report to the Foreign Office, "most picturesque ... the wide sweep of barley, wheat, and oat fields interspersed with plots of marsh, the dark pine woods on the lower slopes, the bare mountain tops above, and the sparkling mountain streams below reminded my companion, a Scotch botanist, of a cultivated highland valley in his native land. "47 Rhododendron choked the foothills; blue Gentiana and red Euphorbia carpeted the pastures: to the "Scotch botanist" it was "one huge flower garden." In the late afternoon, they came to the southernmost of the plateau's two towns, called, in Chinese, Xiao Zhongdian. The barley harvest had begun, and the harvesters were holding a festival, eating boiled beef and piles of buckwheat cakes. The whole place seemed prosperous: shining fields, large white houses, well-fed people. While the land appeared fertile, most of the plateau's wealth came from trade. Caravans from the plateau moved through the length of Yunnan to bring tea, steamed and packed into large bricks, from the Tai Lü (or Shan) states in the far south of the province to Kham and central Tibet. Most households bred horses, and traders from the plateau supplied animals to Tengyue and Burma for the cross-border trade. As the description makes clear, this was a wealthy man, dressed in finery. Forrest coveted his beautiful sword with a scabbard worked elaborately in silver and turquoise. It is not surprising that Forrest imagined this as a photographic moment. The association between guns and cameras was commonplace in colonial situations. As Paul Landau observes, the technologies of gun and camera evolved in parallel after the 1860s. Chemicals developed for ready-made cartridges were adopted for use in dry-plate cameras by Eastman and Kodak; elements of the designs of the best cameras were based on the mechanism of the Colt revolver; both technologies moved toward the capacity to make clean, rapid, repeating shots.54 By the end of the century, game hunting had become a largely visual enterprise, incorporating cameras to create visual trophies. Later, Forrest would photograph long rows of Lady Amherst and white-eared pheasants hung up by their feet from the eves of his house in Nvlvk'ö-both hunting trophies and scientific specimens. In addition, travelers who ventured out of the reach of the armies and bureaucracies of colonial administrations had few resources with which to demonstrate their superiority. Forrest had his sense of personal hygiene: thus his repeated remarks about dirt even at a moment of profound camaraderie. But it was difficult to stay clean and even more difficult to show one's cleanliness to others in a convincing way, especially when they were far better dressed than he. So his gadgets-his Winchester, his camera, his telescope-had to bear the burden of demonstrating difference. The posture of astonishment Forest elicited in this crowd of Tibetans was nearly identical to the "gaping" of which he accused "the Chinese." Yet while those looks made him miserable and violent, these delighted him-and made him think of photography. In other situations, he and his competitors would use their guns to similar effect. Clever Francis Kingdon Ward didn't even have to shoot his: in a village on the Mekong he showed a crowd "what wizards the English are" by making the cartridge pop out of his breech-loading shotgun in response to his whistle. "The men were so obviously taken aback that they merely stared incredulously." "My gun and my camera," he observed, "were always a source of great interest to the Chinese. "55 Later, in Tibet, Kingdon Ward, frustrated in his desire to photograph the shy women of Jana, set up his gramophone in the street, played an operatic prelude, and whipped out his camera to photograph the "enchanted crowd. "56 Chapter 5 shows how Joseph Rock resorted to the same cliché in moments of melancholy. Michael Taussig argues that Europeans and Americans found in the astonishment they provoked with such antics a reflection of their own deep fascination with technologies of mechanical reproduction.57 It is certainly true that these men were fascinated with the wonder they cultivated in others with guns, cameras, and gramophones. But they hardly seemed awed at the mysteries of these technologies. They were all deeply troubled by the sensation of plunging into a sea of looks, where the eyes of others framed their sociality in alien terms. Their attempts, in practice or imagination, to generate astonished looks and freeze them with a camera were efforts to turn the power of "gaping" back on itself. Martin Jay observes that the eye of the camera, unreadable by those at which it gazes, holds the viewer still, "static, unblinking, and fixated. "58 To generate and capture fascinated looks was to draw "gaping" into the familiar field of mechanical reproduction-the field of the "world as exhibition," through which the sights of colonized places were reproduced and exhibited in the metropole. Not being gaped at unless at his command became for Forrest a precondition for social exchange without violence. After his adventurous excursion up the Salween gorge with Litton, he settled down to collect with increased determination. Though he had traveled with cooks, muleteers, and servants, he had until now done his collecting himself. In the summer of 1906, with the aid of missionaries of the China Inland Mission in Dali, he hired two men and three women to collect in the Cangshan range, just west of that city: this was the only time he would ever employ women as collectors. Leaving these five in the charge of one of his servants, he went north to spend the season on the great Yulong range. He took the southern route into the range, straight up the main street of Nvlvk'ö. His letters make no mention of the people he met there. But fourteen years later, he would recall that it was that summer that he first began to hire men from that village as collectors. Over the next thirty years, the men from Nvlvk'ö amassed one of the most extraordinary collections ever attributed to a single botanical explorer. They spent years at a time away from home, eating what they could, sleeping in the open, enduring all the physical and emotional hardships that travel over this immensely rugged landscape entailed. He tyrannized them; he fired them for insubordination; he fumed at them as "Bolsheviks" when they asked for raises; he scoffed at their ritual life when funerals drew them back to Nvlvk'ö. But for all this, it is clear that he developed profound camaraderie with many and sincere respect for a few. They had learned as children many of the plants of the Yulong range. But there were many skilled herbalists among the "Chinese" population of the province who may have made better collectors, had he the imagination to look for them and the linguistic skills or social connections to find them. What made it possible for him to employ these farmers and live with them lay in how they used their eyes. He never once mentioned being stared at in Nvlvk'ö, and given his sensitivities, this is evidence enough. Like the Tibetans of the Gyaltang plateau, Naxi farmers and traders found staring profoundly impolite. Looking directly at a stranger, particularly one of high status, no matter how strangely attired, was deeply disrespectful. Meeting an important stranger on a path or village street, one looked away and went about one's own business, satisfying one's curiosity later from within a doorway or behind a fence. Habits of looking were distinctly gendered as well. For a young woman to look directly at a man not of her household out of doors was improper; older women could manage more direct looks, but again not at high-status strangers. These were widespread habits of ocular comportment, shared with most of the highland Tibeto-Burman-speaking peoples of the province. As it happened, they were also familiar habits, close enough to those he had grown up with. Living amongst people who, however curious, did not stare, he immediately found ways to initiate social exchange even in the absence of a common language: trading cards, shooting his gun, producing specimens. When such deeply installed, tacit habits of ocular exchange were broken by "gaping," possibilities for social exchange were also broken, "blind rage" ensued, and physical violence became his only means of establishing social relations. In addition, "gaping" profoundly fractured his visual field. Under the unblinking eyes of different others, he found it difficult to look at anything but himself, and his nakedness often came to mind. In 1905, complaining to his mother of the "ignorant expressions" of "the Chinese," he commented, "I have become so callus that I can stand now and take a bath with a crowd around me." In company of people who turned their eyes away, he could refocus his own, away from himself, onto the landscape, to find in it the qualities that made seeing productive. In Nvlvk'ö, he learned to turn the eyes of others toward that common object as well, initiating the long and intensive process of ocular instruction through which others' eyes were trained to see in the ways demanded by Linnaean taxonomical science. He could only begin this process once he had broken that mute circuit of eye against eye that gaping entailed. Scholarship on imperial travel has emphasized looking as a mode of knowing and possessing. "The idea of the 'the gaze,' especially as exercised by the white male explorer, missionary, administrator, or itinerant naturalist," writes David Arnold "has rapidly come to be seen as one of the principal expressions of the wider colonizing process. ... 'the gaze' is the prelude to possession in more material and institutional forms, just as travel is more about imposing upon, than learning from, the landscape subject to the itinerant gaze. "59 Travel made the landscape a spectacle, replicated after the mid-nineteenth century in exhibitions for other eyes, in both metropole and colony. Photography provided a convenient model for this mode of knowledge production: a clear-seeing eye, unimpeded by the vagaries of subjectivity, rendering fields of sight into real objects, which could be classified, archived, and exhibited. The temptation for scholarship has been to write as though imperial gazes could, in reality as well as in ideology, be modeled on the kind of vision commonly attributed to the camera. As though vision could ever simply be that of a sovereign master of two eyes, surveying the world and rendering it as representation. As though acts of vision are not always embedded in social fields of vision, composed of intersections of multiple pairs of eyes, intimate and distant, immediate and deferred, real and imagined. The visibility to others of one's own gazing body is constitutive of one's gaze; one can only see as a social being if one sees oneself as visible and one's own vision as including, reflecting, embracing, or deflecting the gazes of others. In the case of imperial scientific travelers like Forrest, this is easier to notice in places off the edge of the map of empire where travelers had fewer resources, material and ideological, at their disposal, to insulate their eyes from those of others. Erik Mueggler is Professor of Anthropology at the University of Michigan. He is the author of The Age of Wild Ghosts: Memory, Violence, and Place in Southwest China (UC Press). "The Paper Road is an eloquent, even haunting narrative of the relationships between colonial explorers/scientists and their native collaborators that makes vivid the theme of 'colonial intimacy.' 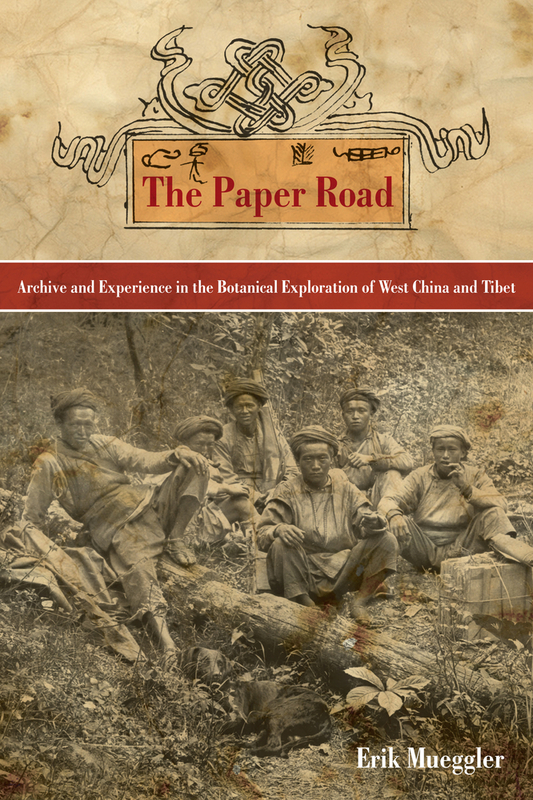 It speaks to scholars working on Chinese minorities and frontier relations, to historians of comparative colonialism, to experts on Tibet and Buddhism, and probably also simply to lovers of tales of mountains and exploration." –Charlotte Furth, Professor Emerita of Chinese History , University of Southern California.